Here is another brilliant little invention, we where lucky enough to win from a fellow blogger in her competition. 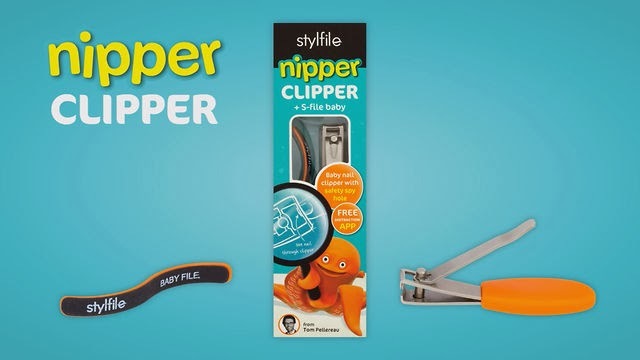 Well that’s all a thing of the past because now you can get the super easy and safe Nipper Clipper from Style file. I haven’t used the “Tommy Tickle” App which you can download for free with it because Finn lets me cut his nails easily but i think its a great idea for distracting younger toddlers whilst cutting their finger nails. I am happy to announce that i now like cutting my sons nails and i am very happy with the end result! The Nipper Clipper has been designed to make clipping your baby’s nails quicker, easier and safer. Say no to tears with this exclusive nail clipper design from The Apprentice winner Tom Pellereau. Featuring a spy hole, the clippers allow you to see exactly where you are cutting, and an easy grip handle means no slipping! The blades on the clipper cut rather than chop, ensuring a more gentle clipping motion and no ‘pinging’ of nails. As if the job hasn’t already been made easy enough, the Nipper Clipper also comes with a fun and colourful Timmy Tickle App to help distract those restless little ones. You can purchase the Nipper Clipper on Amazon for only 9.99 Pounds here. Disclaimer: We have won the Nipper Clipper in a Competition but wanted to spread the word about this great product, all thoughts and opinions are my own.